Less than 3% fat. Ready in 15 minutes. Low in fat. 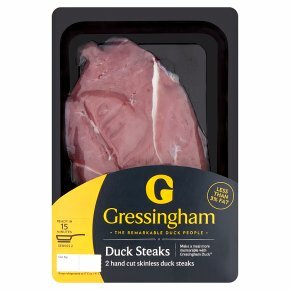 Make a meal more memorable with Gressingham Duck® Cooking with duck makes a meal more memorable and is healthier than you may think, did you know that our duck steaks are less than 3% fat? Duck steaks are perfect with rice, noodles or served inside a bun. Dine in with our duck steaks1. Heat a little oil in a non-stick pan over a medium heat on the hob. Place the steaks into the pan.2. Pan fry the steaks for 8-10 minutes depending on how you like your duck cooked, turn over half way through cooking.3. Rest for 5 minutes in a warm place before serving.